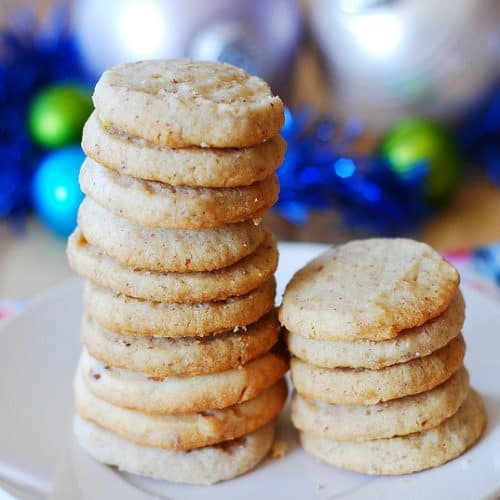 Basic pecan shortbread cookies made with just butter, sugar, flour, vanilla extract, and finely ground toasted pecans. Great recipe for the holidays (Christmas and New Year’s Eve). If you love cookies with nuts – this is the recipe for you. Pecan shortbread cookies have been my faithful companions over the last several days. They are the reason I look forward to coming home from work every day. They are the reason my husband almost finished a gallon of milk in a matter of 3 days. You see, cookies (such as these amaretto shortbread cookies or these hazelnut shortbread cookies) and milk – those go well together. As well as cookies and hot tea. Or, cookies and coffee. Or, cookies and movies, on the couch. 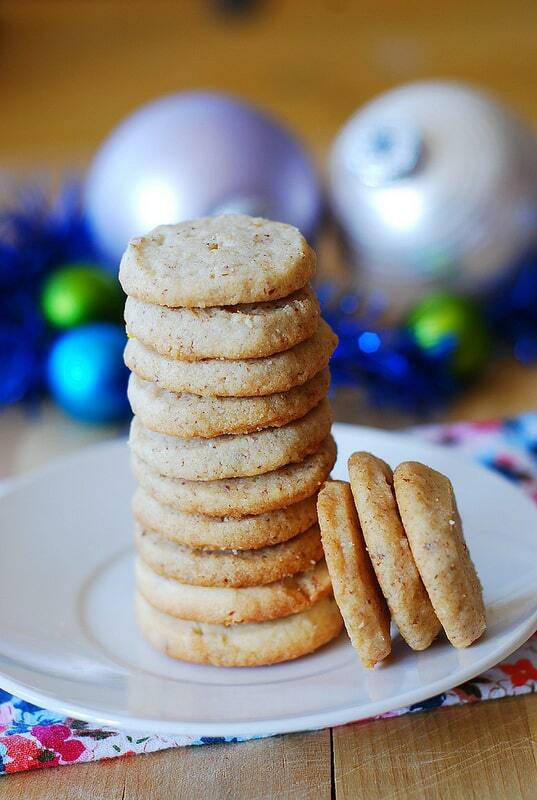 These shortbread pecan cookies are perfect. For everything! Especially for the holiday season. I can’t believe I’ve never made pecan shortbread cookies before! What have stopped me until now? Maybe, it was a price of pecans: why would I use expensive nuts for some basic shortbread cookies instead of saving the pecans for something more sophisticated, such as a pecan pie. That could’ve been my train of thought. Or, more likely, I’ve just never thought of grinding the pecans and adding them to the cookie dough before – not because it’s such a novel idea, but because I have too many other ideas in my head at all times, such as almond crescent cookies or cranberry noels. Oh mine, I’ve been missing out on so much! These pecan cookies are so buttery, light, crumbly, and full of pecan flavor – you will have a hard time restraining yourself. Using toasted pecans is very important in this recipe! Toasting pecans really brings out their flavor and makes the cookies the way they are meant to be: nutty, melt-in-your-mouth, delicate. 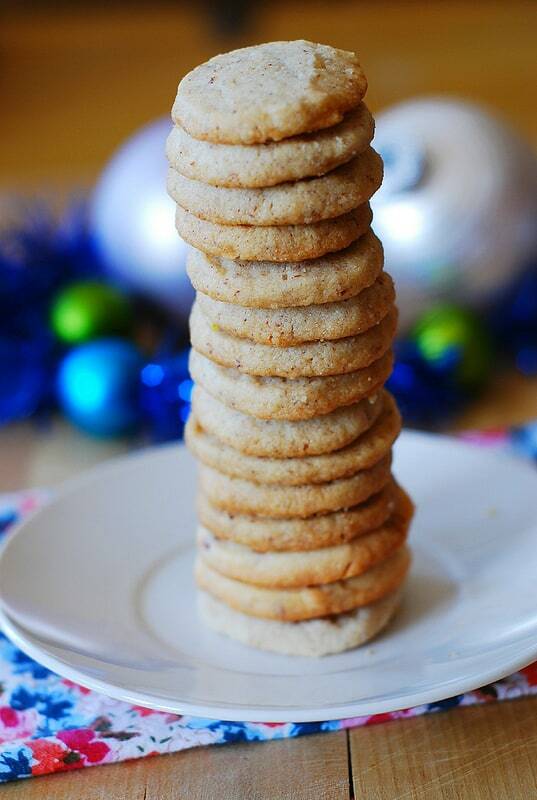 It’s such a classic holiday cookie! Great addition to your Christmas cookie box. Just perfect for this time of year (and beyond). 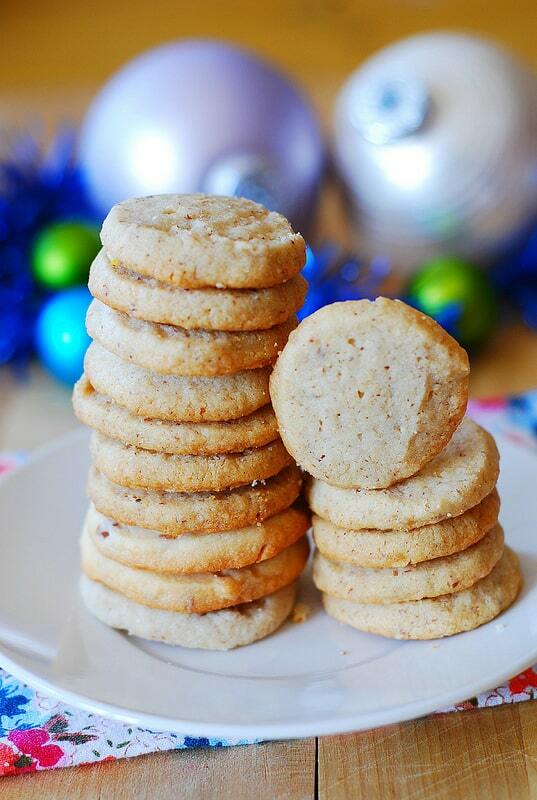 Basic pecan shortbread cookies made with just butter, sugar, flour, vanilla extract, and finely ground toasted pecans. Great recipe for the holidays - Christmas and New Year's Eve. Toast pecans at 350 degrees Fahrenheit for 5 minutes. Watch carefully to make sure they don’t burn – they burn easily. Cool them off completely. To make finely ground nuts, place toasted pecans into food processor and process until finely ground. In a large mixing bowl, beat butter, sugar until creamy. Add vanilla and continue beating. Add 1/2 cup finely ground pecans and beat to combine. In a separate bowl, combine flour and salt, then add mixed flour and salt to the creamy butter-sugar mixture. Do not overmix, just enough to combine all ingredients and form a cookie dough. Shape dough into 4 logs of different thickness (to make cookies of different radius – large and small). Wrap each log in plastic wrap and put wrapped cookie dough in the freezer for 30 minutes, then in the refrigerator for 30 minutes. After cookie dough has been in the freezer and in the refrigerator, unwrap plastic and slice each log into thin cookie slices. Place cookie slices on parchment-lined ungreased baking sheet, spacing 1 inch apart. Bake for about 15 minutes, don’t let the cookies get brown. After about 15 minutes of baking, transfer cookies to wire rack to cool. Simply amazing Julia! I’d finish a gallon of milk in 3 days too if I had these cookies. YUM! 🙂 Pinned! 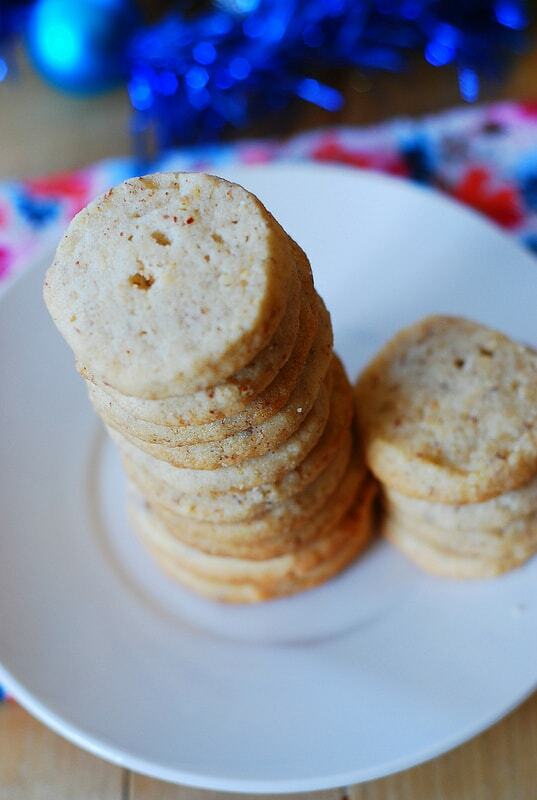 Pecan Shortbread is my favorite kind of shortbread cookie! But, I do love them all. Thanks for sharing, my friend. Pinning! These remind me of a childhood favorite…pecan sandies! I must make a batch of your pecan shortbread! It’s stunning, both the flavors and the presentation! I love pecan cookies:) Never made em before, ~ I am more a cake person. 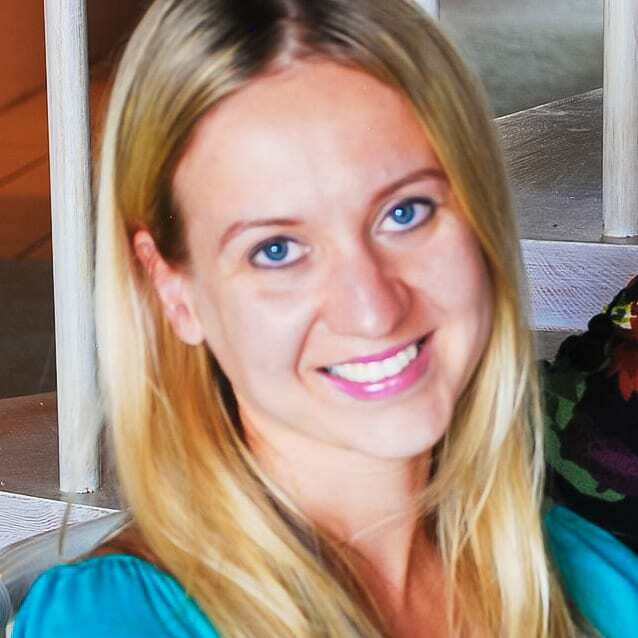 God Bless you abundantly, Julia!! !